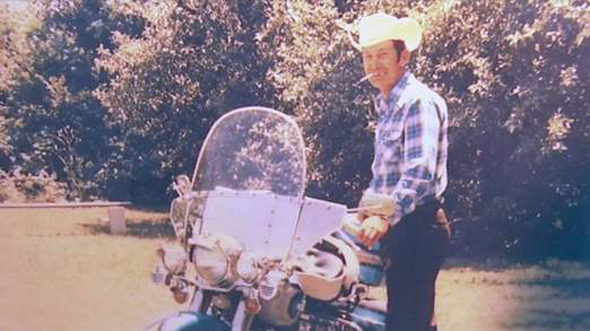 A man who travelled America on the back of a motorbike has been buried astride his beloved 1967 Harley-Davidson. Bill Standley, 82, was lowered into the ground inside a clear glass box in full biking gear and sitting on his prized possession. His daughter Dorothy Brown said the idea came about 18 years ago as he joked about who would inherit his motorcycle. "He said what am I supposed to do? I've got two sons, only got one bike. My sister just off-handedly said 'oh dad just be buried with it'. "I think it was about two weeks after that that it really hit him - what a great idea. We all still thought he was kidding. Eighteen years later, guess what?" She added that he was a "twist of colour on the tweed surface of life", and said he had "a wanderlust". He left home at 13 to work cattle ranches out west, eventually travelling to 49 of the 50 states. He settled down to raise a family in Mechanicsburg, Pennsylvania, but his passion for the road never left him. Work to make his final wish a reality began six years ago. 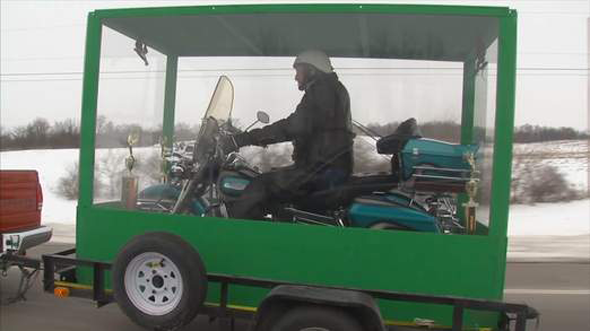 He and his sons built the plexiglass casket that would hold him and his motorbike, and he bought three burial plots next to his wife. One onlooker at the funeral said: "It's going to be hard to top this one." Another added: "Some people walk through the pearly gates, some people ride."